Dinosaur Comics - January 4th, 2011 - awesome fun times! 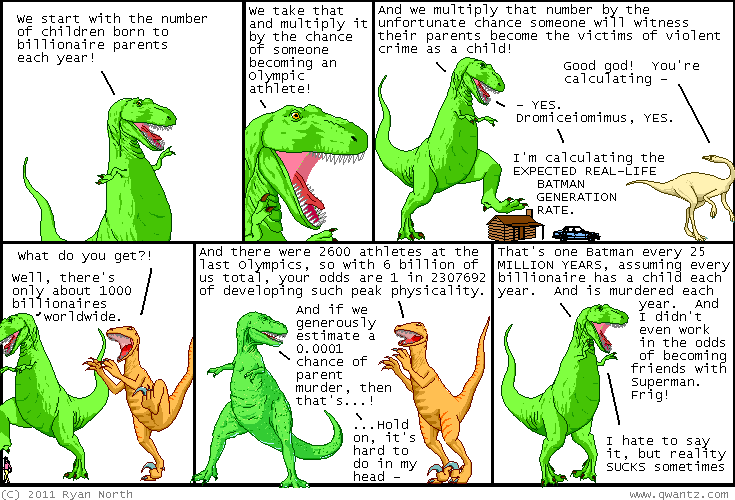 January 4th, 2011: T-Rex IS rounding up to 25 million, but yeah: we've got a long time to wait. And that's with me not working in that BOTH parents have to be murdered - AT THE SAME TIME - in order to keep the odds more likely. However if you somehow manage to survive 25 million years, having Batman around is definitely something to look forward to! In other news, The Wormworld Saga is pretty and promising.